Anna Maria Bligh (born 14 July 1960) is an Australian politician and the 37th Premier of Queensland from 2007 to 2012. Bligh was an Australian Labor Party member of the Legislative Assembly of Queensland seat of South Brisbane from 1995 to 2012. Bligh was the first woman to be appointed Premier of Queensland, the third female Premier of an Australian state, and the sixth female head of government of an Australian state or territory. She led Labor to victory in the 2009 Queensland state election, becoming the first woman elected in her own right as a state premier in Australia. Bligh attempted to win a second full term as Premier in the 2012 state election. However, her party suffered the worst defeat of a sitting government in Queensland history, winning only seven seats. In the wake of the loss, Bligh announced her immediate resignation as leader of the Queensland Labor Party. She also announced that she would resign from parliament and retire from politics, effective 30 March 2012. She was appointed CEO of YWCA New South Wales in 2014. Bligh was born in Warwick, Queensland. She grew up on the Gold Coast. Her parents separated when she was 13. She attended Catholic schools until Year 9 and considered becoming a nun. One of her aunts became a nun and another had entered a convent. However the church's attitude towards divorced people (her mother was no longer permitted to take Communion) reportedly estranged her and her mother from the church. Studying at the Women's Rights Collective which campaigned for legalised abortion against the anti-abortion policies of the Bjelke-Petersen government. Bligh's next role was as Women's Vice-President of the Student Union. She then ran an election ticket called EAT (Education Action Team) in an unsuccessful bid to oust the faction in charge, headed by the future Goss government identity David Barbagallo. 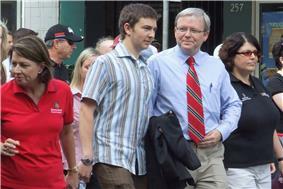 Law student Paul Lucas, Bligh's future deputy premier, was a part of Barbagallo's team. Her 1982 team included the former Minister for Education, Training and the Arts Rod Welford. Anne Warner, who was a future Minister in the Goss Government, was an office holder at the time in the Union. Warner soon become one of Bligh's key political mentors. She subsequently worked in a number of community organisations, including child care services, neighbourhood centres, women's refuges and trade unions as well as in the Queensland Public Service. Bligh was the secretary of the Labor Party's Fairfield branch in 1987. 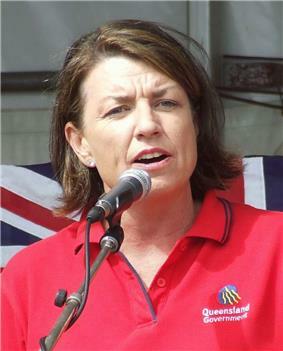 Bligh was first elected to parliament at the 1995 election to the safe Labor seat of South Brisbane, succeeding her former university compatriot, Anne Walker. A member of the Socialist Left faction of the Labor Party, she was promoted to the ministry following the election of the Beattie government in 1998 as Minister for Families, Youth and Community Care and Disability Services. In 2001, Bligh became Queensland's first female Education Minister. She assumed additional responsibility for the Arts portfolio in 2004. In July 2005, the retirement of the Deputy Premier and Treasurer Terry Mackenroth forced a cabinet reshuffle, which saw Bligh promoted to the office of Deputy Premier and Minister for Finance, State Development, Trade and Innovation. Bligh's appointment as Deputy Premier coincided with her election to parliament ten years earlier. In early February 2006, Bligh also gained the Treasury portfolio after Beattie relinquished the responsibility to focus on attempting to fix the state's troubled health system. Bligh had long been touted as a likely successor to the long-running Premier Peter Beattie, and he publicly endorsed her as his replacement when he announced his retirement from politics on 10 September 2007. She was subsequently nominated unopposed by the Labor caucus, in a deal that saw Paul Lucas from the Right faction succeed her as Deputy Premier. She became the leader of the Labor Party on 12 September. After Beattie formally resigned on 13 September 2007, Bligh was sworn in by the then Governor Quentin Bryce. Bligh led Labor to victory in the 2009 state election. Bligh lost eight seats from the large majority she'd inherited from Beattie, and also suffered an eight-percent swing on the two-party vote. Nonetheless, due largely to taking 34 out of 40 seats in Brisbane, Labor still won 51 seats out of 89, enough for a comfortable majority. The election marked the Queensland ALP's eighth consecutive election win; the party has been in government for all but two years since 1989. In winning the election, Bligh became Australia's first popularly elected female premier. The two previous female premiers, Carmen Lawrence (Western Australia 1990–93) and Joan Kirner (Victoria 1990–92), became premiers following the resignation of male premiers (as Bligh did), but both were defeated at the following respective state elections. However, Bligh is not Australia's first popularly elected female head of government. Rosemary Follett and Kate Carnell were both popularly elected as Chief Minister of the Australian Capital Territory, and Clare Martin was elected as Chief Minister of the Northern Territory. In 2009, Bligh was elected to the three person presidential team of the Australian Labor Party, to serve until July 2012. She served as National President of the Australian Labor Party for the 2010–11 financial year. Coal-carrying rail lines, currently owned by Queensland Rail (QR Passenger services will remain nationalised). More than 3,000 workers were to be offered voluntary redundancies, just three months after the privatisation of QR National. Queensland Motorways Limited and Forestry Plantations Queensland were not being sold, but rather being leased for an estimated 50-year lease. Since this announcement, the Queensland Government announced plans to sell Queensland Rail to the public. Revenues from privatisation were estimated at approximately $15 billion, to go towards balancing Queensland's state budget. The sale of these assets aimed at removing significant overheads from the Queensland government's debt portfolio, allowing further growth of the government's capital assets, as well as aiding the government to return to its AAA credit rating. Bligh has faced resistance from both within her party and the trade union movement, but has defended her privatisation plan as 'not negotiable'. The 2009 annual state conference of the Australian Labor Party – Queensland Branch, passed a motion, moved by Treasurer Andrew Fraser MP, seconded by Parliamentary Secretary for Healthy Living Murray Watt MP, supporting the sale of the assets, recognising that the sale will allow the Queensland Government to grow its asset portfolio, as well as retire debt. In October 2006, then Queensland Premier Peter Beattie, commissioned research to see if daylight saving should be re-introduced into Queensland on a trial basis. On 1 October 2007 Bligh ruled out holding a new referendum, despite this government-commissioned report indicating that 59% of Queensland residents and 69% of South East Queenslanders support daylight saving. On 14 April 2010 Independent member for the Electoral district of Nicklin, Peter Wellington, introduced the Daylight Saving for South East Queensland Referendum Bill 2010 into Queensland Parliament, calling for a referendum to be held at the next State election on the introduction of daylight saving for South East Queensland only, while the remainder of the state maintains standard time. In response to this Bill, Bligh announced a community consultation process, which resulted in over 74,000 respondents participating, 64 percent of whom voted in favour of a trial and 63% were in favour of holding a referendum. On 7 June 2010, after reviewing the favourable consultation results, Bligh announced that her government would not support the Bill, because regional Queenslanders were overwhelmingly opposed to daylight saving. The Bill was defeated in Queensland Parliament on 15 June 2011. Bligh's management of and performance during the 2010–2011 Queensland floods was widely approved. Labor had been well behind the LNP, led by John-Paul Langbroek, for most of the time since the fall of 2010. However, the following Newspoll saw a record turnaround in Bligh and Labor's fortunes. Labor rose from a two-party deficit of 41–59 to a lead of 52–48, with Bligh's personal satisfaction-dissatisfaction standing going from a negative 24–67 to a positive 49–43. Bligh's recovery in the polls was a factor behind Langbroek being forced to stand down in favour of Brisbane Lord Mayor Campbell Newman. Newman had become a national figure during the floods, and polling showed he was the only non-Labor politician who even came close to matching Bligh's popularity during that time. However, Newman was not a member of parliament, and a by-election could not be arranged to allow him to get a seat in the chamber. For this reason, Jeff Seeney was elected as interim parliamentary leader of the LNP while Newman led the LNP's election team and simultaneously contested the Labor-held seat of Ashgrove. Bligh harshly criticised Newman's move, saying it was irresponsible for Newman to "cut and run" from his post as Lord Mayor while Queensland was still rebuilding. She also hinted that she might call an election a year before it was due. She had previously promised not to call an election for 2011 to focus on recovery, but was concerned that the unorthodox leadership arrangement on the opposition side could make the co-operation necessary for the recovery effort impossible. On 25 January, Bligh announced an election for 24 March. It was the first time in Queensland history that the voters knew the election date in advance of the parliament being dissolved. Bligh made this decision after learning that the Commission of Inquiry into the 2010–11 Queensland floods would not release its final report until 16 March, rather than the middle of February as originally planned. She wanted Queenslanders to see the report before they went to the polls. Bligh asked Governor Penny Wensley to dissolve parliament on 19 February, formally beginning the 35-day campaign. She began the race as an underdog; the LNP had regained a substantial lead in polling since Newman took the leadership. Bligh was dogged throughout the campaign by the perception that she'd misled voters about the asset sales. With Labor sinking in the polls, Bligh conceded in a 13 March interview with the Brisbane Times that in all likelihood, Labor would not be re-elected. The final Newspoll of the campaign appeared to confirm this, showing Labor's support had sunk to only 39.2 percent. At 24 March election, Labor suffered one of the largest electoral wipeouts in Australian history, and the worst defeat that a sitting government in Queensland has ever suffered, double the previous record-holder of the 1989 election. Labor was reduced from 51 seats to seven, suffering a swing of more than 15 points. This was largely because of a near-total meltdown in Brisbane, which had been Labor's power base for over two decades. The party lost all but three of its seats in the capital, in some cases suffering swings of over 10 percent. Bligh herself suffered a 9-point swing in South Brisbane, and she only overcame her LNP challenger on Green preferences. Ten members of her cabinet were defeated. It was only the sixth time since 1915 that Queenslanders have thrown a government from office in an election. The next day, with Labor's defeat beyond doubt, Bligh announced she was retiring from politics. She had intended to stay in parliament, but said that the severity of Labor's defeat made her realise the party could not "develop an effective opposition" with her even as a backbencher. She resigned as both premier and state Labor leader that day, and handed her resignation to Wensley the same afternoon, to take effect from 30 March 2012. Bligh had intended that the timing of her resignation would allow a by-election to be held on 28 April 2012, the same day as local government elections. Later reports suggested that would not be able to formally resign from Parliament until the writ of election for South Brisbane was returned, meaning that a by-election would be too late to coincide with the Brisbane City Council election. But on 2 April, she was declared the winner, and a writ was subsequently issued for the by-election. Bligh is married to Greg Withers, a senior public servant, with whom she has two sons, Joe and Oliver, both of whom attended Brisbane State High School. Bligh is a descendant of Cornishman William Bligh who is famous for the Mutiny on the Bounty and being the 4th Governor of New South Wales. The name Bligh comes from the Cornish language word Blyth meaning Wolf. Bligh appeared as a contestant on Celebrity MasterChef Australia. She was eliminated in her first heat, losing to the eventual winner of the series, swimmer Eamon Sullivan. On 8 June 2013, Bligh announced that she had been diagnosed with non-Hodgkin lymphoma. Bligh's memoir, "Through The Wall", was published in April 2015. ^ a b Jamie Walker (3 June 2006). "out of left field". QWeekend Magazine. p. 13. ^ Hubbard, Murray (11 November 2006). "Bligh's spirit Anna's bounty – Deputy Premier revealed to be the captain's direct descendant". ^ "Beattie to gauge opinion on daylight saving". ABC. 27 October 2006. Retrieved 5 August 2010. ^ "Qld's Bligh says no to new daylight poll". Brisbane Times. 1 October 2007. Retrieved 5 August 2010. ^ "Daylight Saving for South East Queensland Referendum Bill 2010" (PDF). 14 April 2010. Retrieved 5 August 2010. ^ "Queensland Government Daylight Saving for South East Queensland survey". Retrieved 5 August 2010. ^ "Queensland Government Daylight Saving for South East Queensland decision". Retrieved 5 August 2010. ^ "'"Daylight saving silence 'deafening. 16 June 2011. Retrieved 19 June 2011. ^ Campbell Newman's Queensland coup. Ten News), 22 March 2011. ^ a b Newman's bid for leadership. 7.30 (ABC News), 22 March 2011. ^ Green, Antony. Queensland election preview. Australian Broadcasting Corporation, 25 January 2012. ^ Barrett, Roseanne; Walker, Jamie. Anna Bligh ramps up early Queensland election speculation. The Australian, 26 March 2011. ^ Matt Wordsworth (25 January 2012). "Qld to have March 24 poll". PM (Australian Broadcasting Corporation). Retrieved 28 January 2012. ^ "Bligh officially sets Queensland election date". PM (Australian Broadcasting Corporation). 19 February 2012. Retrieved 20 February 2012. ^ Hewitt, Daniel (15 March 2012). "'"Bligh admits Labor loss 'most likely result. ^ Koren Helbig; Sarah Vogler (25 March 2012). "'"Anna Bligh quits: 'Labor cannot rebuild with me in its ranks. ^ a b "Bligh resigns after election wipe-out". ABC News. 25 March 2012. ^ "Former Premier Anna Bligh may have to resign for second time due to electoral commission technicality". Courier-Mail. 29 March 2012. ^ "2012 State General Election: South Brisbane District Summary". Electoral Commission of Queensland. Retrieved 2 April 2012. ^ "QLD2012 – Update on Close Contests – 3 April". Antony Green's Election Blog. ABC News. 3 April 2012. ^ "Premier Anna Bligh – Biography". ^ Thomas, Hedley (12 January 2008). "Bligh reveals family's dark secret". The Australian. ^ Calligeros, Marissa (2 September 2009). "Anna Bligh to appear on Celebrity MasterChef". ^ Lion, Patrick; Shearer, Geoff (15 October 2011). "Anna Bligh bombs out on MasterChef". ^ "Anna Bligh, the former Queensland premier, reveals she has non-Hodgkin lymphoma". ABC News. 8 June 2013. Retrieved 9 June 2013. ^ "Books of 2015". Sydney Morning Herald. 27 December 2014. Retrieved 4 January 2015.